A death gratuity equal to one year's salary when an employee dies of injuries sustained while supporting military operations. On the U.S. Embassy Iraq staffing -- well, trying to pin down the staffing number over there, is of course, rocket science and I simply do not have the brains for it. Also, with the military withdrawal and the embassy taking charge, a whole lot of big numbers are bring thrown around - 5,000 - 17,000. Security people is a big component but not sure how many non-State/USAID and non-DOD personnel will continue to deploy in Iraq and our consulates there when all is said and done in 2011. Due to the recent "flavor of the month" in Afghanistan, the civilian uplift staffing picture there is a bit more clearer. Seven civilian agencies (State/USAID excepted) account for about 26% of the total civilian uplift. So all those folks, plus some three dozens in Pakistan and an undetermined number in Iraq will be affected by Congress' non-renewal of warzone benefits. In short, if they need mental health care after service in the warzones, they're basically out of luck? 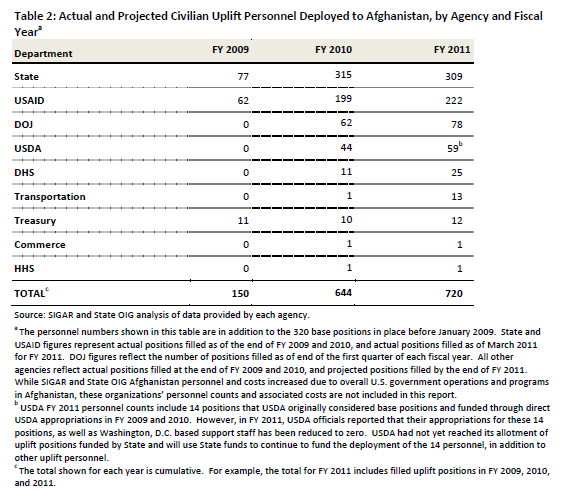 [...] State increased its civilian personnel deployed to Afghanistan from 192 in January 2009, to 501 in March 2011—an increase of 309 personnel.